Cool off under your awning with a Red, White, and Blue Sangria this 4th of July. 4th of July is right around the corner, and what better way to cool off than by treating yourself to a cocktail beneath your retractable summer awning? Show off your American pride with these delicious cocktail recipes. Bittersweet, complex and fruity, the Americano is a red drink named for its popularity with American expatriates in Italy. Directions: Fill a glass with ice and pour in Campari and vermouth, finish with soda. Garnish with a twist or slice of orange. Developed by Harry Craddock, an American who left the US during the prohibition era to perfect his cocktail art. Republican or Democrat, this historic drink will make you feel like a true American. Directions: Add ingredients in a shaker and fill with ice, shake and strain into chilled cocktail glass. 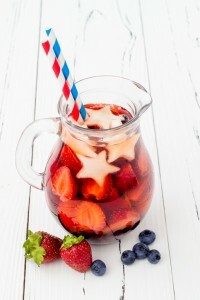 Although Betsy Ross didn’t come up with this concoction herself, this tasty red beverage is sure to infuse you with the spirit of the famous flag maker. Directions: Add ingredients to mixing glass. Fill with ice, stir and strain into chilled cocktail glass. Let this red, white and blue concoction be your 4th of July bottle rocket. Directions: Combine white wine, blueberries, raspberries, strawberries and apple juice together in a large pitcher. Stir together for 1-2 minutes so the flavors can meld. Cover and refrigerator for 1-4 hours. Stir in champagne, apples and ice gradually as you’re ready to serve. Is your awning ready for you to enjoy the summer breeze this 4th of July? The Carroll Awning Company provides the best quality, energy-efficient canopies, awnings, Sunesta shelters, and frames for any business, restaurant, home, or apartment. We design, create, and install custom-created canopies and awnings all year round!